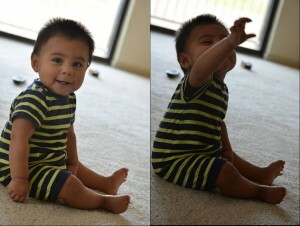 One of the early motor skills baby learns is rolling. This skill can be discussed by breaking it down into moving from the back to the belly, from the belly to the back, and the connection of those two into one full log roll all the way around to the starting position. For this post, we will look at the movement from the back to the belly. There are a few ways to initiate every skill, and we are examining the various possibilities for initiating this new skill. 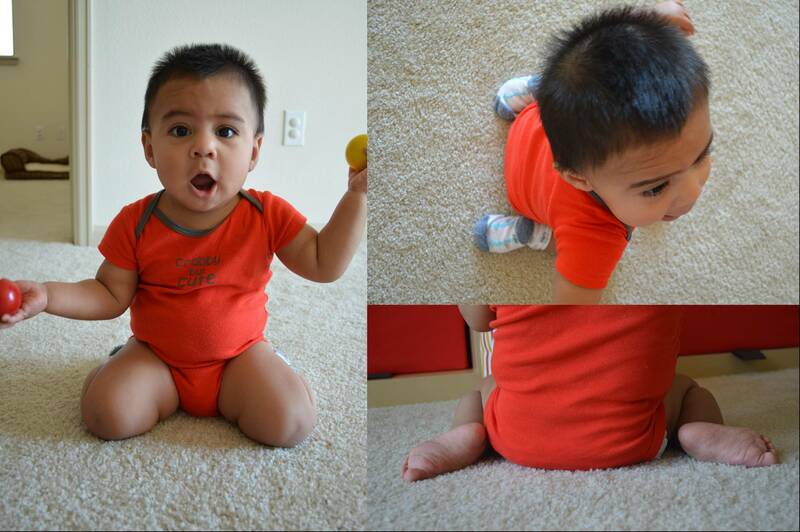 When asking the question, “How can I teach baby to roll,” consider observing how babies begin the movement. One of the popular ways that a baby begins to roll is bending up one leg toward his chest and then moving it to the side. The leg is connected to the pelvis at the hip joint, which is one of the heaviest bones in the body. As the leg moves far enough out to the side, the pelvis tilts and soon the weight of the pelvis takes baby onto her side and into the motor skill of rolling. (See photo above.) Baby learns this skill as she is lying on the floor kicking and moving her legs around. The movement is just an exploration, an improvisation, and suddenly she moves one leg far enough to the side that she is pulled onto her stomach. It was an accident! She was not intending to roll, it just happened. What a wonderful discovery for her. She figures out how to repeat it many times so it becomes an skill and not just an accident. Mastering the motor skill of grasping and reaching is integral to the motor skill development of rolling. Often the roll is initiated by a reaching action. That is a reaching action with the intention to grasp something, usually a toy. The arm is connected to the torso or ribcage at the shoulder joint. When baby reaches her arm across her body, the ribcage begins to move and she tips into the beginning of a roll. Often the arm and the leg on the same side of the body will move a the same time and in the same direction to facilitate the baby turning onto her tummy. Some babies develop a habit of quickly pulling their arm back to the side when they begin to move because they are a bit startled. When they pull the arm quickly back to their side they roll back onto their back. The pulling action of the arm backward pushes the ribcage backward and baby rolls onto her back again. 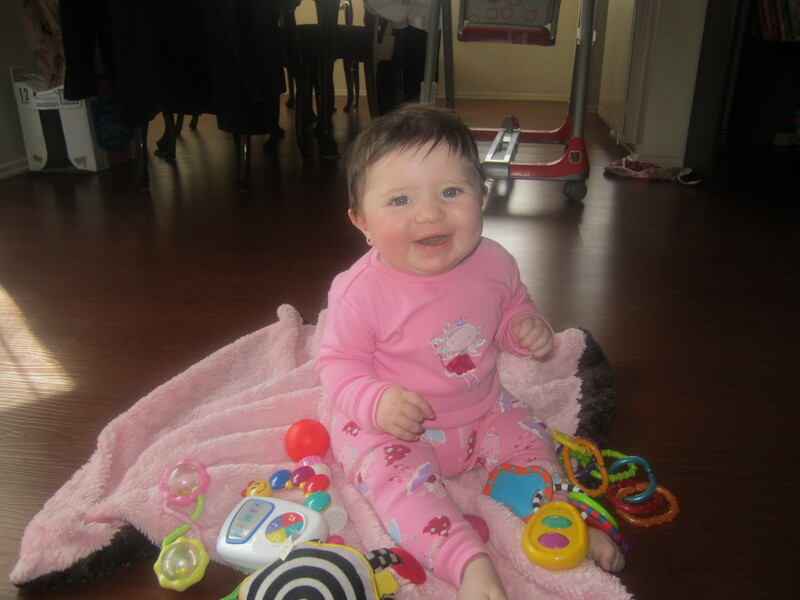 By placing a toy nearby, baby now has an intention to grasp something and is less likely to pull the arm backward. Providing the motivation for the action is always key. She wants that toy! How do we know where we are in space? Through pressure. When you sit on a chair you feel the contact of your bottom against the seat of the chair and your feet against the floor. When you recline on the sofa to watching TV, you feel the pressure of the back of the legs, pelvis, torso, shoulders, and head against the fabric on the furniture. These sensations of pressure tell you that you are lying down. This ability to feel orientation in space is called proprioception. We have receptors in the cells of our skin, muscles, joint, and bones that respond to the pressure of touch by sending signals to the brain to pay attention to the area receiving the touch. For baby, she has been in the watery environment of the womb for many months. Water creates pressure and helps baby feel her body more clearly. After birth, parents often swaddle baby to recreate the secure feeling in the womb of the pressure of water on baby’s body. The pressure of the material snuggly wrapped around her body is comforting because it helps her feel where she is in this new airy environment. Her new environment gives less sensation to the skin, bones, and muscles than the watery environment of the womb. Babies enjoy swimming lessons because the water is familiar to them and the pressure feels comforting. Benefits of baby swim lessons include gentle strengthening and improved proprioception as she feels each body part very clearly as it moves against the pressure created by the water. Learn how to swaddle your newborn and locate a school offering swim lessons for babies to develop your child’s proprioception. Baby’s brain sends the signals to her muscles to move. As baby learns her motor skills, touch is very informative. The pressure of your hand on her leg clarifies that particular body part in her brain. When she feels her leg more clearly she can use it in an improved way. For example, after tapping and gently squeezing baby’s leg she may begin to kick that leg with more vigor. An activity to try at home is to gently tap each of baby’s limbs in a rhythmic way and name them for her. If repeated regularly, she will like it and it may calm her when she is fussy. Just remember, through the sense of touch information is being sent to the brain where her motor skills originate. The baby in the photo at the top of the post is on her stomach. She feels she is on her stomach because of the contact of her abdomen and chest with the floor. When her teacher puts her hand on baby’s back, baby feels that part of her body more clearly. She also feels where she is in an improved way because of the contact to both sides of her torso, front (against the floor) and back (from the teacher’s hand). She feels more secure when she feels the dimensionality of her torso rather than only one side. This technique can be used to improve motor skill activities such as tummy-time. When baby is on her tummy you can tap her back so she feels more secure and will learn to lift her head. Simple hands-on skills can be learned to guide baby through each motor milestone.